By the late 80s, the horror genre had an established trend that would define the decade: the slasher film, which gave rise to the most recognizable icons of that particular generation. By '87, both Freddy and Jason were hitting their stride, and Michael was on the verge of a comeback. Lost in the shuffle and the sands of time were various other films with lesser known characters that never reached the heights of their contemporaries. Entering the fray at this time was The Stepfather, a low-key horror-thriller that would go on to unexpectedly spawn two sequels and become a bit of a cult classic. Starring minor-scream queen Jill Schoelen and the recently resurgent Terry O'Quinn, it's a film that might have fallen into a bit of obscurity for the generation raised on DVD, as the film has only recently made its way to the format. Henry Morrison appears to be a normal man at the beginning of the film as he looks to be performing a routine shave; that is, until he begins washing the blood off his hands and nonchalantly walks out of the house where his family has apparently been butchered. One year later, Morrison resurfaces as Jerry Blake, a real estate agent that has married the recently-widowed Susan Maine. Hoping to build an idyllic family life with Susan and her troubled daughter, Stephanie, Jerry puts on a convincing facade that fools everyone. However, the charade begins to crumble once his relationship with Stephanie becomes strained, shattering his illusions about his perfect family. It also doesn't help that the brother of a former victim is hot on his trail and is attempting to expose his maniacal ways. More of a subtle thriller, The Stepfather represents a bit of a break from the slasher/body count cycle that dominated the decade. 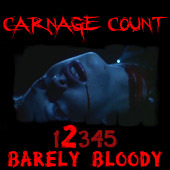 Instead of focusing on gore and on screen violence (the body count is actually quite low and on screen murders are few and far between), the film slowly builds tension as it moves to its breaking point: a climactic showdown with all the involved parties. Generally speaking, the movie plays out more like an edgy, violent drama, as the interactions between Jerry and the various people in his life slowly begin to degenerate and drive him to murder. The little bit of violence that is parceled out before the climax is far from gratuitous and is believably worked into the narrative of the film, which keeps it from becoming a typical slasher. Though it's often lumped into that sub-genre, The Stepfather is anything but, and it's a refreshing change of pace for those familiar with the era. The film's effectiveness no doubt hinges on O'Quinn's performance, which exhibits a range of emotions that the actor is able to move between within seconds. O'Quinn's character requires him to change from gentle, caring, and calm to being maniacal within the same scene, and it's a role that could have become laughable in less capable hands. The Lost star handles everything that's thrown at him, and the result is one of the lesser-heralded good performances in the genre. Jerry Blake is a disturbing character who reminds us that the scariest monsters often reside next door to us and hide behind an unsuspecting smile. Most disturbing is the fact that you generally get the impression that Jerry simply wants what many people want: a normal, loving family. While it certainly doesn't make you empathize with the character, it does make him unique in that he doesn't exactly wear his depravity on his sleeve like many horror villains. The rest of the cast is also solid. For whatever reason, Schoelen never broke out of her scream queen mold, but her performance here shows she had potential to do so. Convincingly playing a 16 year old at the age of 23, Shoelen injects the Stephanie character with a "girl next door" quality that makes her easy to relate to. It's also interesting that the character is somewhat damaged and has had trouble accepting her father's death; this keeps her from becoming overly generic and a typical "good girl." Her scenes with O'Quinn are particularly well done, as the two personalities clash well and even make their scenes appropriately uncomfortable at times. Stephen Shellen is another excellent addition in the role of Jim Ogilvie, the man attempting to track Jerry down. He brings another empathetic center to the film, and his story adds another dimension of tension and suspense, as his pursuit of Jerry becomes one of the more interesting sub-plots of the film. The film is all brought together with the competent direction of Joseph Ruben. Already working with an intriguing and solid concept, Ruben doesn't rely too much on flash and style. Instead, he lets his story unravel slowly and naturally, choosing to build suspense and tension and reserving the shocks only when necessary. I must also note that Patrick Moraz's synth laden score establishes a moody atmosphere. Unlike many films of this era, The Stepfather is carried on the strength of its actors and its script, and Ruben's direction allows these elements to shine as well as they should. If you're expecting a gorefest or a body count picture here, you might be a bit disappointed; however, if you're looking for a film with some genuine suspense and a memorable character, you'll likely be pleasantly surprised by this often overlooked gem. The Stepfather character never became as infamous as many of his contemporaries, but this first film showed a lot of promise that was unfortunately never met as the quality of the two sequels steadily eroded. As previously stated, the film has only recently made it to DVD, courtesy of Shout Factory, who has released a special edition of the film. The disc features a commentary with director Ruben and "The Stepfather Chronicles," a retrospective that takes a look at the making of the film. The audio/visual presentation is also solid; the transfer is crisp and accurately reflects the film's low key, natural look, and the stereo soundtrack renders all the dialogue intelligibly. Its certainly been a long wait, but Shout Factory has brought this cult classic home in a fine package. Fans looking to revisit this one have no doubt already rushed out to buy it like I did--after all, it had been over ten years since I'd seen the film, and I'm happy to report that the film has held up very well over that time. Those of you visiting The Stepfather for the first time are in for a treat, as it's been one of horror's most requested DVDs for a reason. At any rate, everyone needs to make room for daddy on their DVD shelf and Buy it!